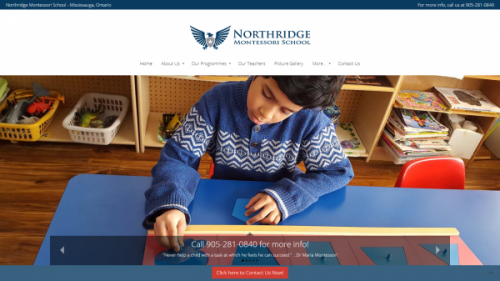 Northridge Montessori School has launched their newly redesigned website. It provides various information regarding the school, Montessori programmes and curriculum, admission requirements, picture galleries and many other topics that may be of interest to many parents in search of a Montessori school for their child. Mississauga, ON – July 20, 2017: Northridge Montessori School is pleased to announce that it has launched their newly redesigned and updated website. The new website provides various information regarding the school, Montessori programmes and curriculum, admission requirements, picture galleries and many other topics that may be of interest to many parents in search of a Montessori school for their child. Their new website, at northridgemontessori.com, has been totally revamped in order to be more user-friendly for improved online user experience. It has a new fresh look and feel; it is mobile optimized for mobile device users; and very easy to navigate to browse its new and updated content. Northridge Montessori offers an exceptional educational program that combines a wide range of social activities with a broad academic curriculum. Their program is based upon the educational philosophy of Dr. Maria Montessori and is designed for children from 18 months to 6 years old. Among other things, they have: large and bright premises with large windows; access to an indoor gymnasium; a large outdoor playground; open throughout the year including summer, March and winter breaks; Free Before and After school program; and also hot and nutritious lunches and snacks prepared daily on site by their qualified chef. “Please visit our new website where we provide you with more important information about our school and our Montessori programmes so you can decide if it’s a good fit for your child. You can also visit our school, tour our premises, and speak with our teachers. Call us to book an appointment.”, added Mrs. Munira Hyder. Check out their new website at www.northridgemontessori.com or contact Mrs. Munira Hyder directly at 905-281-0840 for more information about Northridge Montessori School.